I like to come up with different breakfast ideas, because my kids really don’t care to eat eggs every day the way I do. 🙂 So, this morning I decided I was going to make apple fritters, and I came up with this recipe, that was a huge hit!! Note, that I wrote 4 servings. This just means, it feeds four people. We each had two fritters, and there was one extra one. So, if you want plenty of extras, you may want to adjust the recipe. I am a mom, blogger, and freelance writer. I consider it a great honor to be working for fastpaleo.com. Paleo/primal has significantly improved my life. Peel and cute apple into bite sized pieces (you can see on the picture what mine looked like). Whisk eggs for about a minute, then add coconut milk and continue mixing. Add, vanilla, baking soda, coconut sugar, and cinnamon and mix in until well combined. Your last ingredient is the coconut flour. I used a whisk, so I added one tbsp at a time. If you’re using an electric mixer, you can pour it all in at once. When everything is well combined, add the apple pieces and stir them in. 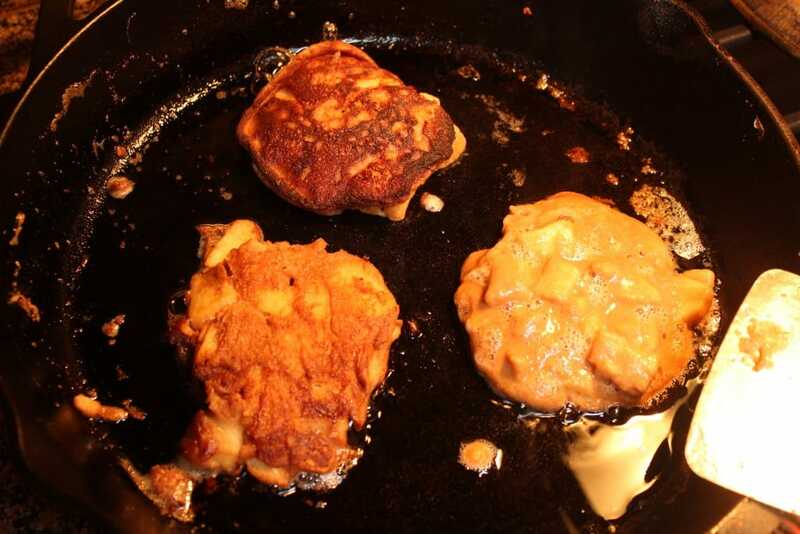 Heat a cast iron pan, until it is really hot, turn to medium heat, add plenty of coconut oil (or whatever oil you choose to cook with), and add the fritters. Experiment with the size and thickness. I found they’re harder to flip, if they’re too thick, so I left them thinner. I made sure they fit easily onto my metal spatula for easy flipping. Cook each side for about 5 minutes, or flip a couple of times to avoid getting them too dark. They really are super delicious and can be enjoyed without any syrup. Of course this is entirely up to you. As for the sweetener. I like coconut sugar, but of course you could use honey, stevia, or whatever you prefer.